Peco 00 Gauge Nickel Silver Streamline Code 100 SL-86 Right Hand Large Radius Insulfrog Turnout. Nickel Silver left hand turnouts which have previously been on a layout but in excellent reusable condition. 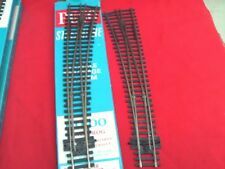 Peco SL-E187 Curved Double Radius Left Hand Point Electrofrog code 75 OO Gauge. Condition is New. Dispatched with Royal Mail 1st Class Large Letter. Peco SL-E186 Curved Turnout Right Hand Electrofrog Code 75 Point. Condition is New. Dispatched with Royal Mail 1st Class Large Letter. PECO long l/h curved point insulfrog, OO gauge - unboxed, code 100. Condition is Used. Dispatched with Royal Mail 2nd Class Letter. The wire underneath the point from the frog has been removed. The wire underneath the point from the frog has been cut short to sleeper edge and power leads have been soldered to fishplates\railsides at toe end of point. THE LONGER PIECES HERE ARE BETWEEN 45cm AND 30cm AND ARE FLEXI - THE REST STANFARD STRAIGHTS PLUS A POINT, COUPLE OF PL-20 ISOLATING SWITCHES, SMALL CURVES AND QUARTER STRAIGHTS - 32 PIECES IN ALL. GOOD LUCK…! Curved double radius Turnout Angle:11.25 degrees left hand. Scale / Type: OO Scale. We will always help you to have a 100% positive happy buying experience. Our Code: PEST-245. Part Number: ST-245. Add to favourites. Point In good condition and fully working. We are enthusiasts and modelers who have successfully turned our hobby into our livelihood. Could do with a lite clean. Point In good condition could do with a clean. We are enthusiasts and modelers who have successfully turned our hobby into our livelihood. Fish plates are all in place. Peco SL-87 Code 100 Insulfrog Curved Left Hand Point (OO gauge) Curved left-hand point. Nominal radii: Outside, 1524mm (60in) Inside, 762mm (30in) Length: 256mm (10 1/16in). OO gauge Code 100. 80 thou (.080") 2.0mm thick clear plastic card. Code 100 Insulfrog. Peco Streamline SL-87. Left Hand Large Radius Curved Point. OO/HO Gauge. Scale / Type: OO Scale. We will always help you to have a 100% positive happy buying experience. Our Code: PESL-87. Part Number: SL-87. Add to favourites. Curved Double Radius Turnout. L/H Electrofrog.Nominal radii: Outside 1524mm, Inside 762mm. A beautiful example of the prototype in miniture. Curved double radius Turnout Angle:11.25 degrees Right hand. Scale / Type: OO Scale. We will always help you to have a 100% positive happy buying experience. Our Code: PEST-244. Part Number: ST-244. ELECTROFROG POINT. LEFT HAND CURVED. Peco ST-259 Point Underlay Curved Dbl. Used model railways & collections always wanted. How it started; I have been interested in model trains since I was a child. It was more fun and much cheaper, now I can fix most locos so they run like new. Peco SL-E186 Code 75 Electrofrog Curved Right Hand Point (OO gauge) Curved Double Radius Turnout. R/H Electrofrog. Nominal radii: Outside 1524mm, Inside 762mm. A beautiful example of the prototype in miniture. PECO STREAMLINE SL-86X & 87X CURVED POINTS LEFT & RIGHT HAND IN BOX V.G.C.